Get 100% up to £50 + 25 bonus spins use code: ONE. Online casino sites tend to go one of two directions when it comes to how they choose to market themselves, there are those sites which focus on affluence, decadence and serious gaming, and their counterparts who opt to aim more for the fun and entertaining angle. With a name like Fruity Vegas, you’d assume that this site has gone very much for the second of these two options, but it isn’t that black and white. Surprisingly, Fruity Vegas seems to have gone more for the former, which makes the choice of name particularly odd. Launched in early 2016, and using what must have been one of the only words left that had not yet been combined with the word Vegas to create the name of a casino site, Fruity Vegas has developed a good following in its relatively small time on the market, but there is a lot more growth that can be done. But does Fruity Vegas have the tools to do that? Is this a site that looks likely to continue to go from strength to strength and see its popularity increase? Or is this as good as it gets? To get answers to these questions, one must take a closer look at the content on offer. How content is packaged is almost as importance as the content itself, and Fruity Vegas does not seem to have a full understanding of exactly how to do that. It isn’t that this site is unattractive, it isn’t, maybe a little derivative, but not unpleasant, the problem seems to be that Fruity casino has no idea what it’s supposed to look like, so you just get a sense of confusion when you look at it. The logo’s excellent, the words Fruity and Vegas are in different fonts, that go together, but also represent the individual meanings of the word, but after that, everything veers off track a bit. A blurry photo of Vegas in the background does little to help, although makes sense when the name is considered, but past that everything is far too sleek and sophisticated to be described as ‘Fruity’. If this was a site called Classy Vegas, or Smooth Vegas, then the design work would work (although it will still look like not enough effort had been made) but with a name like Fruity Vegas, there just needs to be a bit more fun than there is, I get that Fruity may refer to slot machines, but that’s not really an excuse, is it? 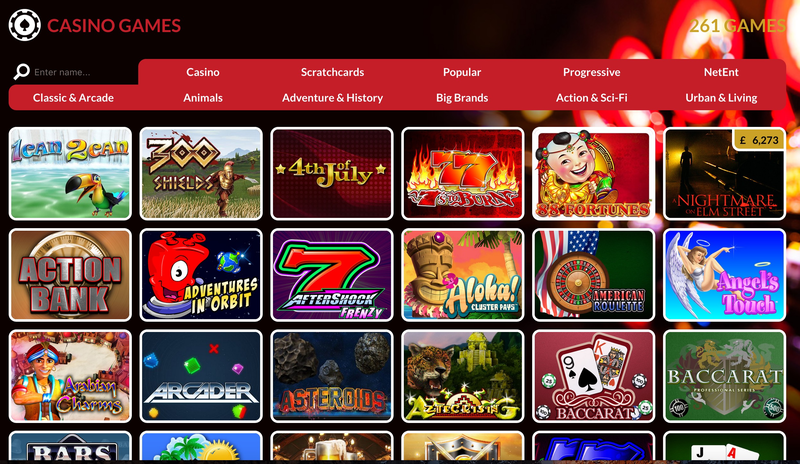 Fruity Vegas brings you a strong mix of well-known games, and lesser known titles from indie providers, with Aristocrat Gaming, IGT Interactive, Nektan, NetEnt, NextGen Gaming, NYX Gaming, Realistic Games, SG Gaming, and Williams Interactive all represented within the available options. Obviously, your slot classics are all here (the ones from the available software providers at least) including Cleopatra, Starburst, Gonzo’s Quest, and Rainbow Riches. You’ll also find popular new titles including Cleopatra Plus, Motorhead, Wheel of Fortune on Tour, Fairytale Legends: Red Riding Hood, 1421 Voyages of Zheng He, and more. Basically, every new title you’ve heard about can be found at Fruity Vegas. You’ll also find roulette, blackjack, and other table and card games, although these options are fairly limited, especially for a site with Vegas in its name. It’s hard to come up with a conclusion for a review of Fruity Vegas, because sometimes it’s amazing, such as with its new releases and promotions, and sometimes, like in the case of table and card games and general design, it just feels like not enough effort has been made, so make you'll have to make up your own mind about it!